This is a great book to read to your elementary science students. 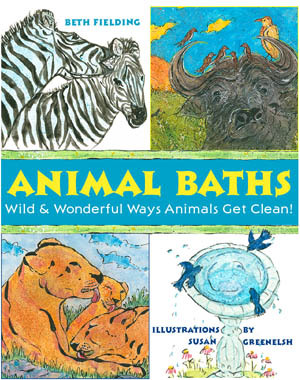 It's all about animal baths and emphasizes behaviors that young children will recognize and to which they will relate. Elephant, rhinoceros, zebra, bird, turkey vulture, cat, praying mantis, squirrel, bat, porcupine, buffalo, chimpanzee, turtle, fish, coral, and human baths are all examples of cleaning for survival. This creative book covers all the basics—from mud and dust baths to the use of tongues and claws and teeth. It also explains scamming, shedding, and slamming when an animal is cleaned during its bath. Readers will imagine using paws like a washcloth or shedding outer layers of skin to clean themselves. How about having birds groom your fur or fish clean your shell? This book captures interesting animal behavior and is a must for the elementary science classroom. It's a great resource to use to support lessons on diversity and adaptations. Once you've read it aloud, students will return to it.